I'm a country girl at heart. I grew up in Mountain Home, a small Idaho town with a little bit of farming and a lot of Air Force Base. Yes, I'm a military "brat" (though I only moved once--when I was two and a half years old--that hardly qualifies me as a "brat"). My favorite past times were (and still are) playing sports (any and all) and enjoying nature. I've learned to combine the two by exploring the world of mountain biking. I love teaching, and, call me crazy, but I love teaching Junior High students. I love their youthful vigor and delightful senses of humor. This will be my 10th year! I got married at the end of the 2014-15 school year, moved up to Davis county and I'm expecting my first child in September. We've already got a group of 10 people (students and parents) and we're looking for more. YOU be the next to join!!!! Invite your family members, friends, and cousins, too! If you'd like more information, please email me at iamaliciaclark@gmail.com . 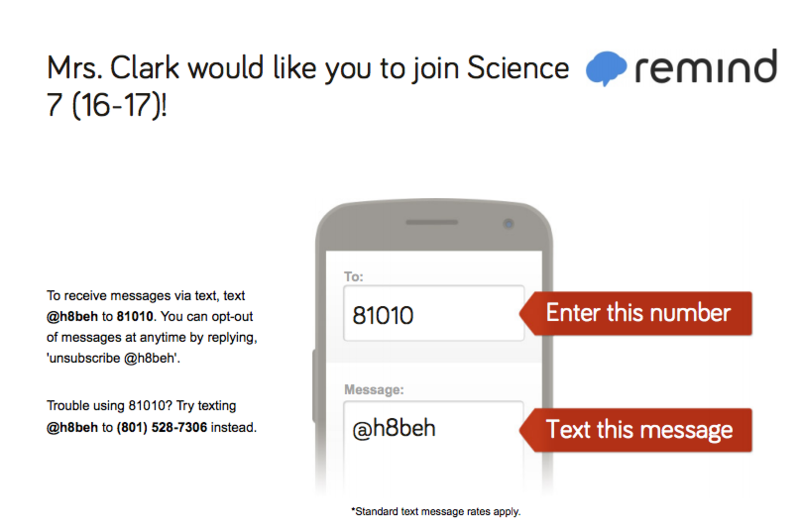 "Remind is a free communication platform built for teachers. 36 million people use Remind and we're in half of all U.S. public schools. "Remind allows teachers to safely and efficiently communicate with students & parents about important classroom information and school activities. Participants sign up as a student or parent and choose to receive messages by text, email, or in our app. "We know that privacy and security are important issues when dealing with teacher-to-student and teacher-to-parent communication. We have worked hand in hand with administrators and teachers to design key product features based on those concerns."